“Prince well be our ruler”, “long live the prince”, the kingdom roared so. 14 years of exile for the step son she asked and led to the king’s nemesis. He laid his vicious plans to fly away, leaving the prince in a plight. The prince finally won, and there was a tale to tell. The time to return to his kingdom came at last. In his praise the victory song they sing. 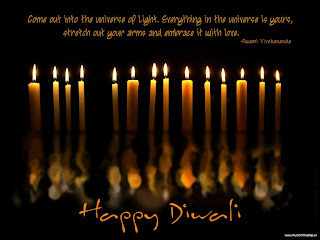 Just fold their hands in unison to greet every one A Very Happy Diwali!!! For those not from India, Diwali is a major Indian festival celebrated every year on Amavasya(No Moon Night) of the Kartik month (Indian Calendar)to mark the return of Lord Ram back in Ayodhya after killing the viscious Ravana. Its celebrated all across the country with lights, candles and fireworks. For more details check the wiki link here. A tale really well told! How long did u take to write this? Happy Diwali to you too and also to entire family. Coming from you this is one of the best compliments I have ever received. I wrote it in half an hoour or so. @ Trinaa: Thank u ji!!! better i dont wish now[its too late]…!! @brocasarea: Better late than never. happy Diwali!! This is a nicely-written verse. 🙂 Wish you a happy Diwali. @Poonam: Thanks a lot for the appreciation. Beautiful poem. Flows really well. As to the context…I don’t know… though I believe Sri Rama was a role model.. the ideal human being..divine and beautiful, I have serious problems with the way He treated Sita, as far as our mythology goes. Makes me wonder…. who is a better partner/companion – The evil usurper (Ravan) who respected and cherished the woman, or the good king (Ram) who pandered to the whims of his subjects rather than uphold that chaste bond of marriage? Or is this just a story spun by male chauvinists, who believed that an abducted woman is ‘impure’ and ought to be punished? GOK! @Pal: Well about Ravana & Rama its a very debatable topic. I have a very different perspective on the same will write a post on this very soon stating my POV :-).